Bringing you a giant bear hug in bowl form. That’s what comfort food like this feels like to me; on days when I am tired, when I am exhausted, when I just want to curl up on the couch and enjoy meals like this one. And so, my vegetarian mushroom stroganoff was born. 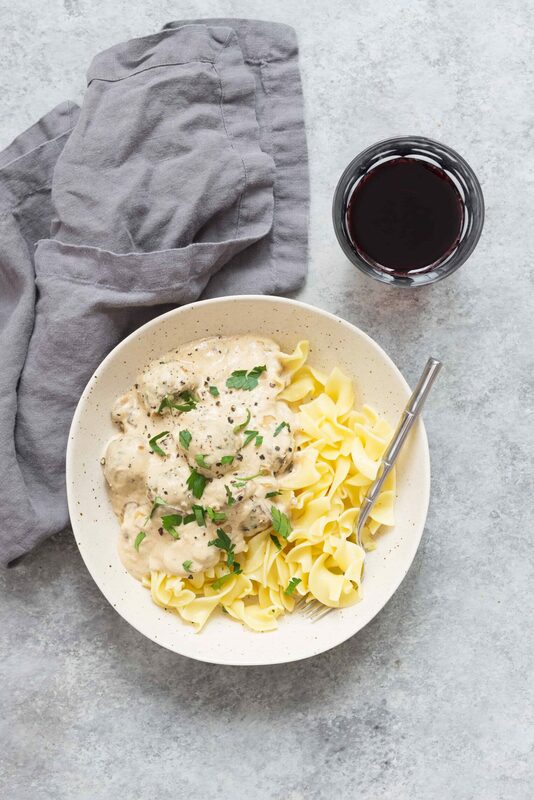 Fall always reminds me of stroganoff as it’s a meal that my mom made over and over again when I was growing up. 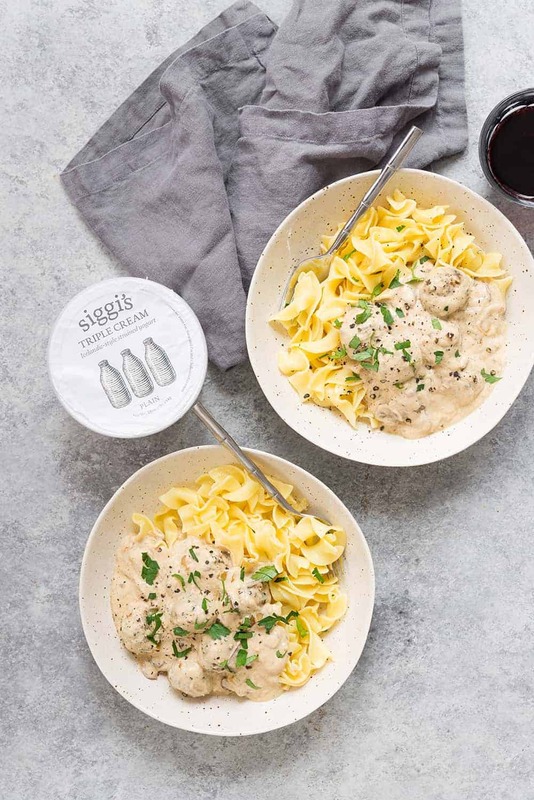 I took her classic recipe and veg’d it by swapping in the best mushroom meatballs instead of meat and then swapping in my favorite siggi’s yogurt for heavy cream. 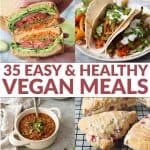 Vegetarian or not, I promise this is a meal that everyone in your house is going to love. Flavorful mini meatballs? Check. 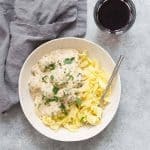 Tender egg noodles? Check. 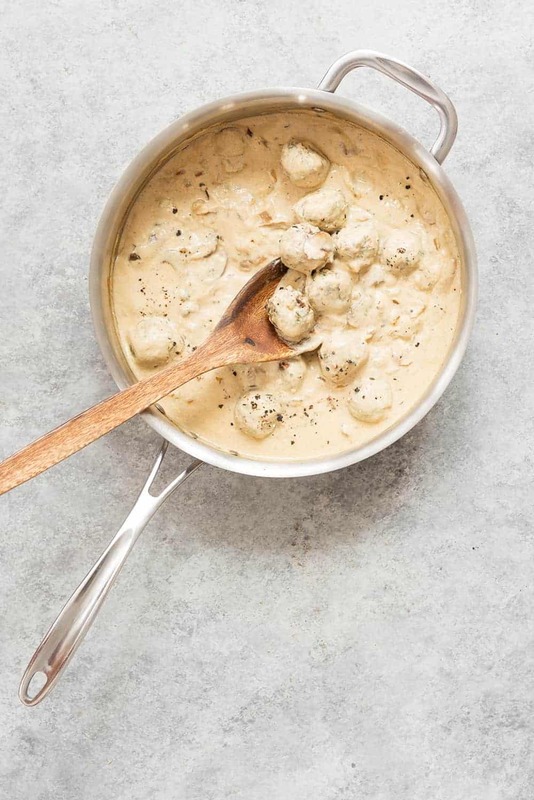 The dreamiest mushroom yogurt sauce? Double check. Swoon, it’s so good my friends. 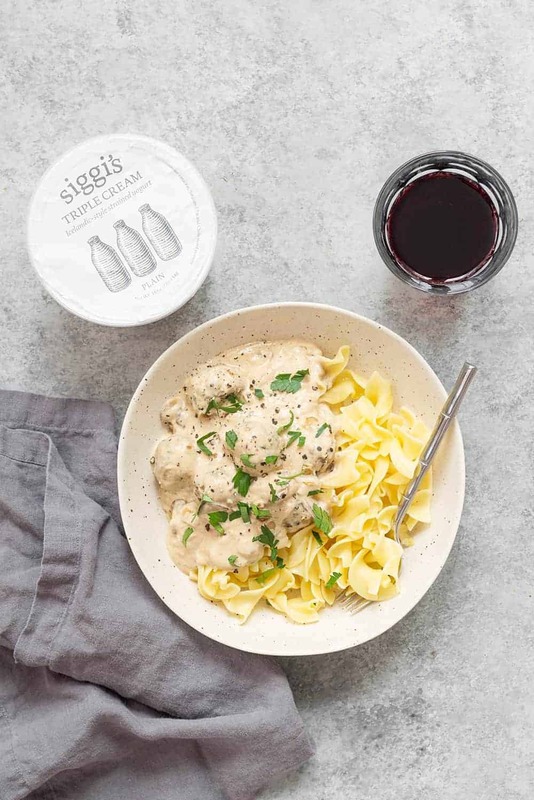 As you know, I’ve been partnering with siggi’s for the past five months to bring you my favorite yogurt based recipes. From pumpkin cheesecake bars, lemon blueberry muffins, mango popsicles, enchilada soup, you all have been loving these recipes as much as we do. Even though I consider myself to be predominantly plant-based; I do enjoy quality dairy like siggi’s. Their yogurts are the best on the market: creamy, perfectly tart and not-too-sweet. Great for a snack and incredible in recipes. It’s why you’ll always find a tub of two of siggi’s in my fridge. I adore that they are lower sugar, made with simple ingredients and it’s something that I feel good about giving Vander as well. Don’t these meatballs look incredible? 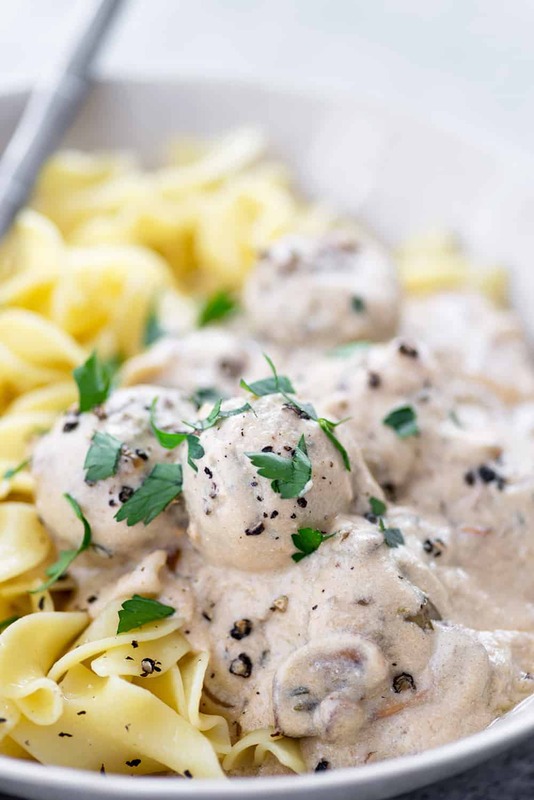 I figured it was time that I created a vegetarian mushroom meatball that’s versatile enough to be used in a variety of recipes this Fall and winter. While the meatballs do take a little advance prep, they can be made a day or two ahead of time. You can also make the meatballs, brown in the oven, then freeze. I know this recipe looks like it has a lot of steps, but it comes together fairly easily. Make the meatballs first then boil the water for the noodles while you make the sauce. Once the water is boiling, add the meatballs to the sauce to simmer while the noodles cook. From there, drain and assemble! I’m using siggi’s plain triple cream yogurt, which is a workhorse in my kitchen. I use it for just about any recipe that calls for sour cream or greek yogurt and it’s delicious on it’s own for a quick snack. I promise you that you’ve never tried yogurt like this before; it’s incredibly rich, creamy and perfect for so many recipes. Since I use it so often, I typically buy the larger 24ounce container, though you can also use the smaller 5.3ounce container for this recipe. Siggi’s yogurt really is the best. It doesn’t contain any artificial sweeteners, gelatin, artificial colors, preservatives, or high-fructose corn syrup. The plain varieties contain just milk and live active cultures. That’s it! Using siggi’s triple cream also increases the protein count, which helps aid in fullness. Hope you enjoy this one! We got a few snow flurries this weekend and man, I don’t think I’m fully prepared for winter. Thankful I’ve got cozy dinners like this one to get me through! 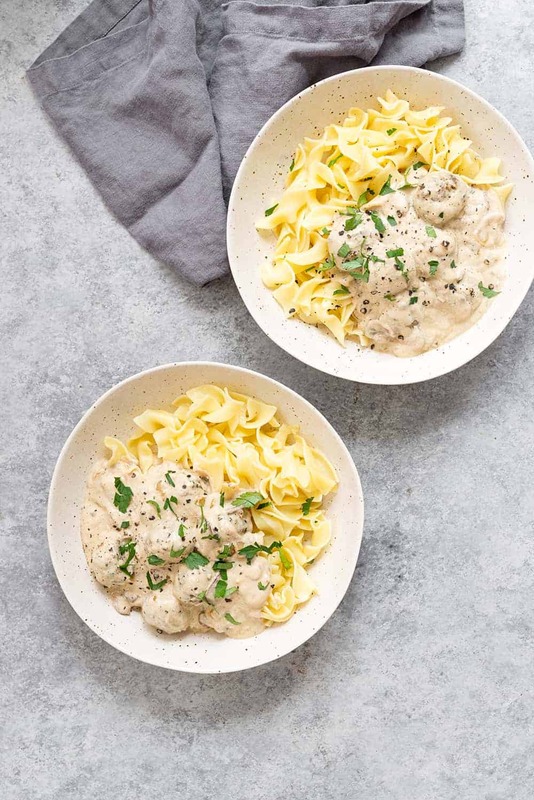 This vegetarian mushroom stroganoff with meatballs is easy to make and SO savory and delicious! 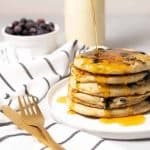 It’s also lighter on calories, higher in protein and made with simple ingredients. Perfect for chilly evenings this winter. Clean the mushrooms and very finely chop, preferably using a food processor. Heat the olive oil in a pan over medium heat and add the onions and mushrooms. Cook until mushrooms have browned and liquid has evaporated and onions are cooked down, about 10 minutes. Remove from heat and stir in the garlic and stir for 20 seconds to incorporate. Place the mushroom mixture into a large bowl and add the oats, cheese, bread crumbs, parsley, egg, salt, pepper and oregano. Mix together with a spoon until mixture comes together; it should hold together when pressed. Place in the fridge and allow to rest for 30 minutes. When ready to bake, preheat the oven to 450 degrees F and line a baking sheet with a silicone baking mat (like a silpat) or parchment paper. 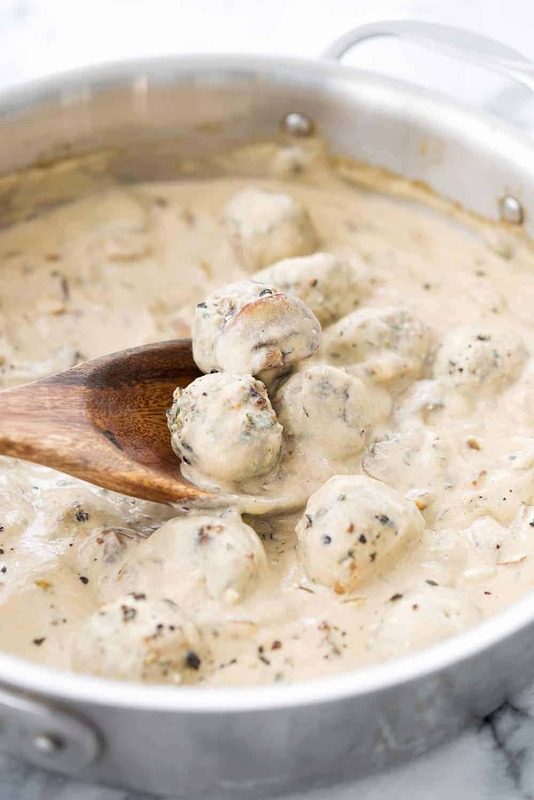 Form meatballs into small balls, using a 1 tablespoon scoop. 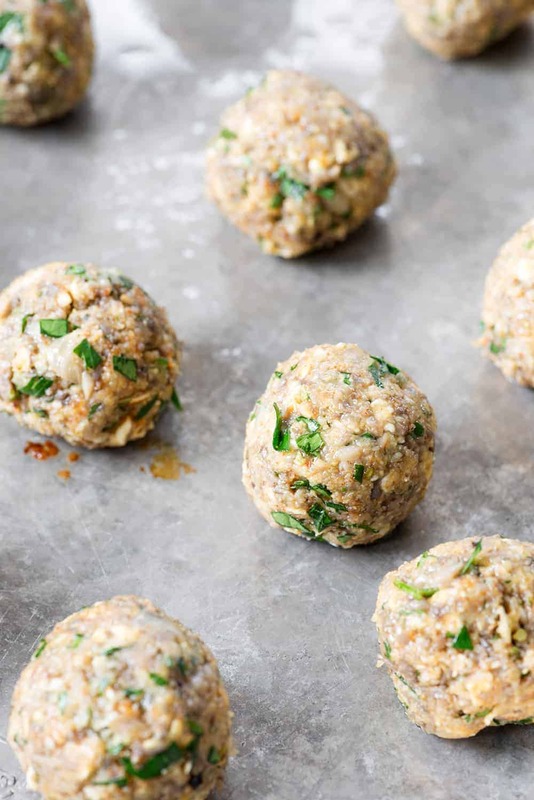 Roll meatballs between hands to form a smooth ball, then place on the prepared baking sheet. Repeat for the rest of the meatballs, then drizzle with olive oil. Bake for 15 minutes until golden brown; flipping halfway through baking time. While the mushrooms are cooking, prepare the rest of the sauce. Bring a large pot of salted water to a boil. Once boiling, add the egg noodles and cook until al dente according to package directions. Heat a large skillet over medium-high heat. Add 1 tablespoon of oil and the onion and saute until onion is soft, about 6 minutes. Add the garlic and mushrooms and cook until mushrooms are browned and cooked down, about 10 more minutes. Add the remaining tablespoon of oil along with the flour and cook for about 2 minutes until mixture is lightly browned. Stir in the broth, mustard, thyme and salt and stir, until mixture thickens, about 3 minutes. Add in the meatballs and simmer for an additional 10 minutes. Remove mixture from heat and stir in the yogurt until just warmed through. Serve over hot cooked egg noodles and garnish with parsley. Delicious! Easy to make. Thanks for the recipe! So glad you liked it! Thanks Carissa!